Juicy grated apples are the secret to these moist, flavorful burgers. Grate or shred the smaller apple into a large bowl. Add onion, sage, Dijon mustard, salt and a few grinds of black pepper. Mix the ingredients well, then add the turkey, and gently mix with your hands. Divide the mixture into four even portions and form patties. Thinly slice the medium-sized apple crosswise and remove the seeds. Toast the buns. Stir the Dijon and honey together in a small bowl. To cook the burgers, place a large skillet with a lid over medium heat and heat for about a minute. Spray or brush the pan with canola oil and add the patties. Let cook for about 5 minutes per side, uncovered, then insert an instant-read thermometer into the thickest part of the patty. When it reads 160°F, the burgers are done. (See Tips & Notes below for a grilled version.) Top each patty with a slice of cheddar, cover the skillet, and remove from the heat to allow the cheese to melt a bit. 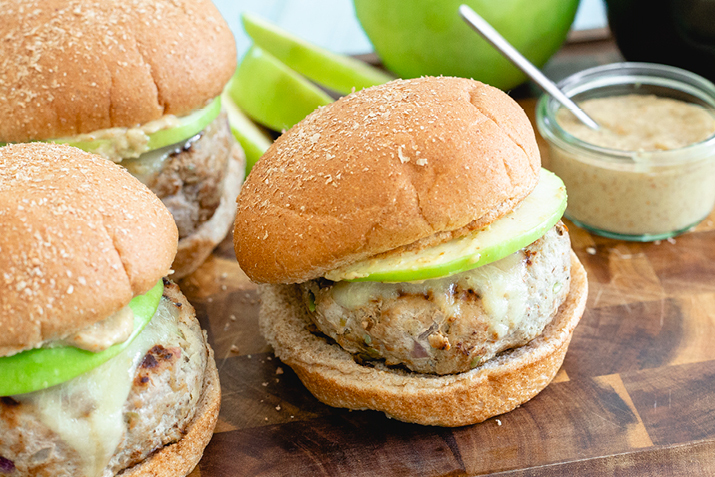 Place each patty on a bun; top with apple slices and honey-mustard spread. Serve immediately. Serve these cheeseburgers and with thick-cut potato chips and coleslaw or—to carry the apple theme even further—a Waldorf salad. For a grilled version, grill the burgers for 4-6 minutes per side until cooked (an instant-read thermometer in the thickest part of the patty should read 160°F).